OK – this is VERY late, but there is some good news. I’ve been coding away in php / wordpress and should now be able to generate these with much less effort – and so much sooner. You asked to be notified if we see anything strange in the email notifications. I don’t know if you mean this or not, but this is how your last one appeared to me- complete with the code showing. That’s really strange as the mail that went out looked good to me and should have had all that fixed. It’s almost like you got an earlier version. Could you reply to that mail if you get a chance so I can see it, and I’ll try again in a couple of days time. 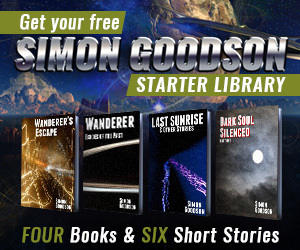 Simon Goodson is the author of the massively popular and highly rated Wanderer’s Odyssey science fiction series, as well as the Dark Soul Silenced books and many short stories. This site contains free stories, progress updates, reviews, competitions and much more! April 2018 Update – Wanderer 5 is here! March 2018 Update – Wanderer 5 has cleared editing!